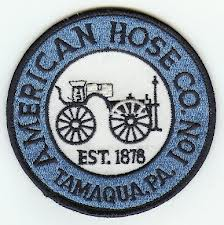 American Hose Company #1 "HOME OF THE ROOTS"
1822: Tamaqua Fire, rescue and EMS, dispatched to 324 North Railroad St for smoke in a structure. Location will be on Pleasant Row, family out of the house. Quick response from all companies in the borough, AHCO responded with E776, followed by E775 and L770. C772 on scene and assuming command, fire located in stove unit. C772 requesting E776 to respond in, other units to hold where they are at. E776 cannot access Pleasant Row to get to house, PD unit blocking intersection. E776 requesting county to notify PD to move their vehicle. PD came back to vehicle and moved it out of the way, E776 on scene. Crew checked for any extension, all units cleared shortly after, C772 remained on scene. © 2019 American Hose Company #1. All Rights Reserved.